In a mixer, add cream cheese, coconut milk and powdered sugar. Mix on medium for 5 minutes or until completely combined. Then add in shredded coconut, and mix to incorporate. Set aside. In a small bowl, whip egg and water together to make an egg wash. Set aside. Unroll pie crusts and with a large circle cookie cutter cut as many circles as possible. Once all circles are cut out, place 1/2 teaspoon of coconut cream on the center of each pie crust circle, then top each center of the coconut cream with 1/2 teaspoon of strawberry jam. Dip your finger in the egg wash and circle the edges of each pie crust circle with egg wash.
Then fold one edge of the pie crust circle over to enclose filling, making a baby taco shape. With your fingers, press all the edges together. With the edge of a fork press all the edges together to enclose the empanada. Stab the fork into the center of the empanada to give the center a little room to bake and not burst. Place on a cookie sheet lined with a baking mat or wax paper. With a pastry brush, dip into the egg wash and brush each empanada across the top. Remove from oven and allow to cool for a minimum of 15 minutes. Enjoy! When folding pie crust to enclose filling inside of the empanada, wipe any excess filling that dips out of the edges with a napkin for a cleaner empanada. I remember sitting on a beach in Mexico with a big frothy fresa colada. I had asked the waiter to replace the pineapple with strawberry because I wasn’t in the mood for piña at the time. It was one of the best flavor combos my mouth had ever experienced. I ordered that drink for the rest of my vacation and have been enjoying it ever since. 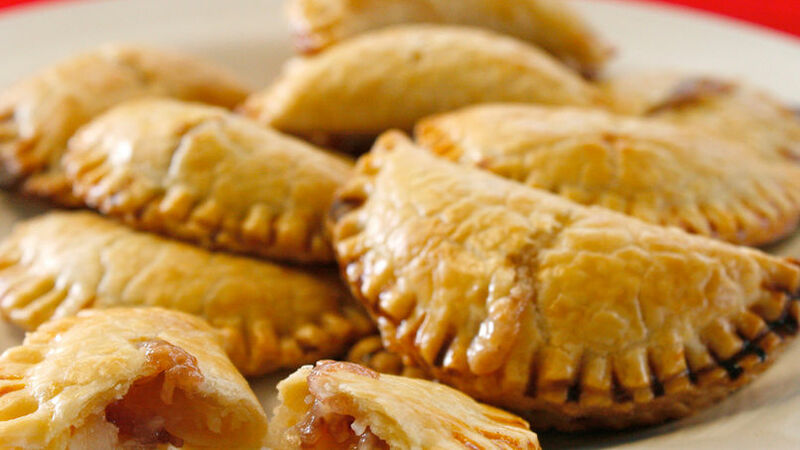 Recently, I was at the bakery and looking at all the delicious empanadas…. I had apple, pineapple, strawberry, and custard cream to choose from, but I still wasn’t satisfied. I was craving something more. I wanted that feeling of sitting on the beach in Mexico with my strawberry coconut combo. Then it was clear, I would need to run home and make this combo in an empanada myself. The results were sublime. Here is my recipe for you and your family to enjoy.